A natural or organic sunblock may be for you! Avoid harsh manufactured chemicals found in commercial sunscreens. Your skin is the largest organ of your body. What you put on your skin is absorbed into your body. Do you really know the chemicals you’re using? You may be doing your body more harm than good. The commercial market is flooded with sunscreens, but do they contain questionable chemicals? Some chemicals can generate powerful free radicals, unhealthy for body and skin. Dangerous free radicals are unstable molecules that attack and assault the body’s cells from different sources. They can affect the immune system and threaten human vitality. Even a single free radical can damage millions of other molecules, preventing proper body functions. They speed up the aging process with collagen breakdown and reduced oxygen in cells. Sun exposure is not exclusively linked to skin cancer. The FDA has determined some chemicals safe for use in commercial sunscreens. Most chemicals are only allowed for use up to certain percentages but most sunscreens, with toxic chemicals, can increase the risk of skin cancer. “Natural” commercial sunscreens may have toxic chemicals. STOP! Check your sunscreen. Does it contain any of the chemicals listed below? If so, you may want to throw your sunscreen in the trash. Beside each chemical, I’ve mentioned some side effects to consider. Don’t completely rely on commercially marketed natural or organic sunblock. Look closely at the ingredients in your products, then you decide the best sunscreen for you. PARA AMINOBENZOIC ACID: Release free radicals. May cause skin discoloration and/or skin allergies. AVOBENZONE: Degrades in light, loses effectiveness for skin protection. Generates strong free radicals. OXYBENZONE: Generates powerful free radicals. CINOXATE: May cause allergic reactions. PADIMATE O: Release free radicals, damages DNA, has estrogenic activity, may cause allergic reactions. DIOXYBENZONE: Generates powerful free radicals. PHENYLBENZIMIDAZOLE: May cause skin sensitization. HOMOSALATE: Weak hormone disruptor. Can cause dry skin, acne, rashes. May worsen eczema/psoriasis. MENTHYL ANTHRANILATE: Has flammability. Can irritate skin and eyes. TROLAMINE SALICYCLATE: May cause redness or other skin irritation. OCOTOCRYLENE: Can cause allergic reactions to sensitive skin. 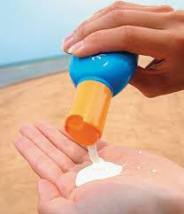 Fast Sunscreen Recipe: Mix 2 tablespoons zinc oxide to favorite lotion, containing NO citrus oils. - Store in dark glass jar, in cool and dry place, to extend life. - Use high quality coconut oil. Use Virgin or Extra Virgin types. - Do not inhale zinc oxide. Wear a face mask in sunscreen preparation. - Make organic sunblock with organic ingredients. “Organic” labeling differs from “Natural”. Organic has a legal definition and international standard. If something is organic it's labeled on products. Contrary, if something is natural the FDA does not require labeling in the USA. ANTIOXIDANT FOODS: Eat a daily supplement of foods with natural vitamin c, e, beta-carotene, zinc or selenium. Boost your immune system! Avocados, berries, broccoli, tomatoes, red grapes, garlic, spinach, tea, carrots, soy, whole grains, beans, eggplant, raisins, apples, pomegranates, plums, onions, mangoes, nuts, sweet potato, green and yellow peppers, squash, strawberries, pumpkin, prunes, seafood, tuna, beef, poultry and dairy products. DRINK GREEN TEA: Its antioxidants attack free radicals that can damage DNA. It's rich with epigallocatechin gallate, (ECGC). This antioxidant inhibits the growth of cancer cells, without harming healthy tissue. There are many green tea benefits! “SAFE” AMOUNT OF SUN EXPOSURE DAILY: Evidence suggest that sun exposure, without sunburns, can decrease the risk of melanoma. Ultraviolet light from the sun is in two wavelengths: UVA and UVB. Discover the difference. UVA: Penetrates skin more deeply; can cause free radical damage. Constant during all daylight hours. UVB: Helps skin produce vitamin D. Vitamin D improves bone health and builds a strong immune system. UVB waves are low in the morning and evening. They are high at midday. 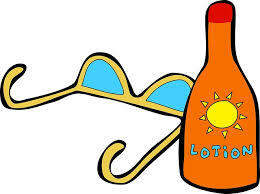 Sunscreen can reduce the skin's ability to make vitamin D up to 99%, depending on the SPF level. Air pollutants can block the amount of vitamin D absorbed by the skin. - Spend about 15 minutes in the sunlight as a good way to catch natural vitamin D. Never look at the sun directly. Over exposure to UVA and UVB waves can contribute to the risk of skin cancer. - Protect skin and eyes. Wear a hat, visor, cap. Wear a light shirt/jacket with sleeves. Wear sunglasses with 100% UV protection that filter UVA and UVB rays. Wrap around sunglasses offer more coverage protection. Polarized sunglasses makes it easier to see in bright conditions. - Aloe Vera Gel, Kukui Oil, Cocoa Butter, Shea Butter soothes sunburns. Find more homemade skin care tips and homemade recipes, now!